The Charlotte Times: Coral Flyer Now in Sabah! Coral Flyer Now in Sabah! and all who love the good (and new) things in life! 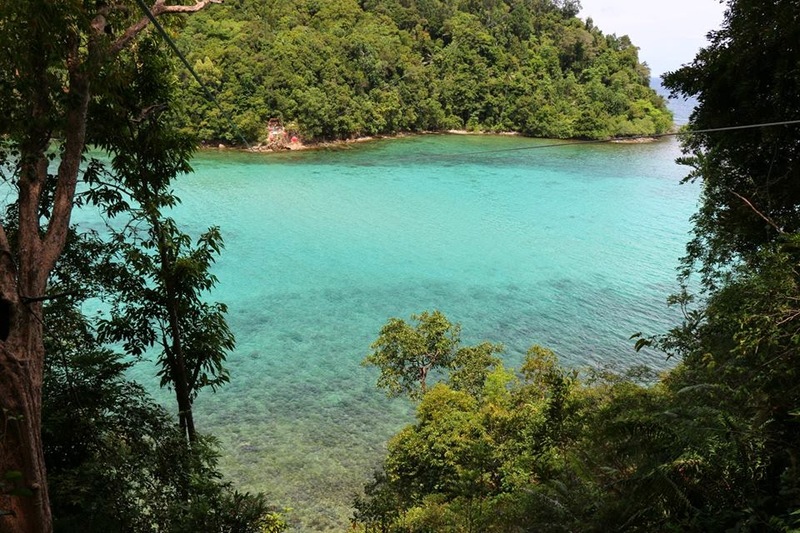 What's the latest attraction in 3 most famous islands off the coast of Kota Kinabalu? 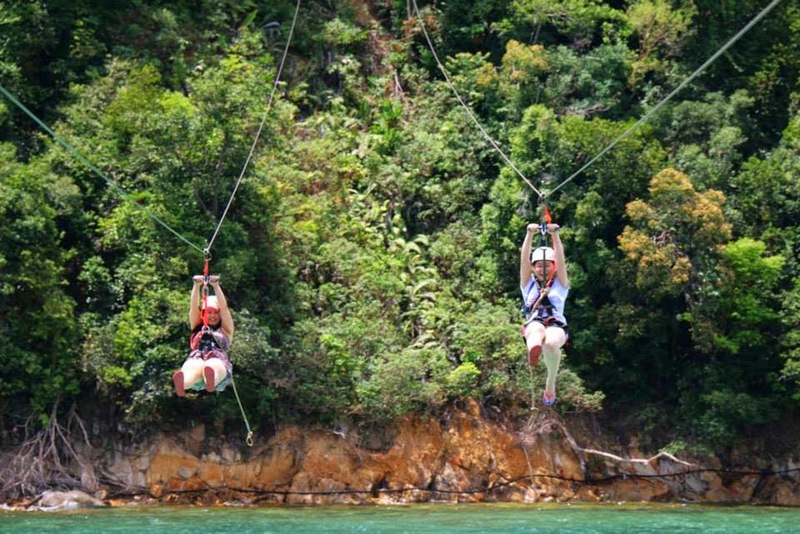 the Coral Flyer , the world's longest island to island zipline! if you love figures, thats 250 meters of screaming fun! The pro photographer on site took this pic minutes before he himself went on the ride! 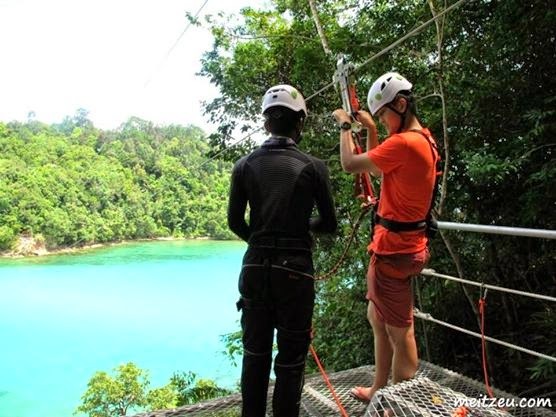 and crystal clear sea dotted with corals and fishes below as you zip down the super long zipline! and a very strict (rightly so) boss who personally overlooks the operations everyday! Fellow blogger Hayden is prepped by professionals with top notch safety harnesses and helmet. when it comes to activities that require me to risk my life or to jump off a certain height. In fact, I'm scared of almost everything a normal human may be afraid of. I'm scared of the dark, clowns, flying cockroaches(omg, especially that!) , con men, robbers, weird sounds at night, or... "Did i lock my car door? What if there is a man hiding in the boot? maybe they planted a bug in my car and they are gonna trail me home?!" Yes, I'm that much of a coward. But thank God nothing triggered my panic attacks at the Coral Zipline! My point is, i'm such a coward but i can still complete this Coral Zipline experience in one piece, so there is really NO excuse for any young or old to miss out on the fun of this amazing ride! Friendly Sabahans calmed my nerves as i asked silly questions, the professionals double checked my harnesses and helmet making me feel really safe, chit chatted with me for a few minutes , and to my surprise, after chanting OMG for about a minute, i was able to walk off the platform that was perched on top of a cliff overlooking the beautiful sea unto my Coral Flyer experience! 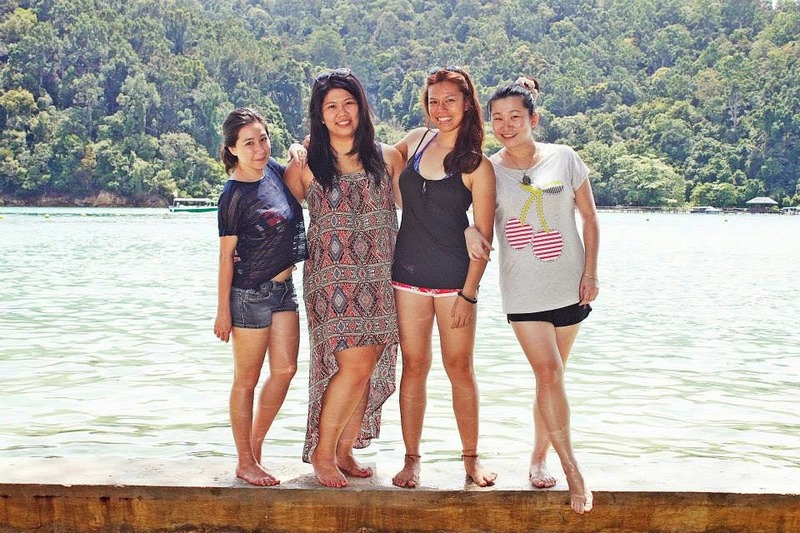 See the fatty on the left, yeah thats me but i was smiling and enjoying the view. but I knew sooner or later, i just had to do it. ow i understand why the others couldn't stop gushing about this! 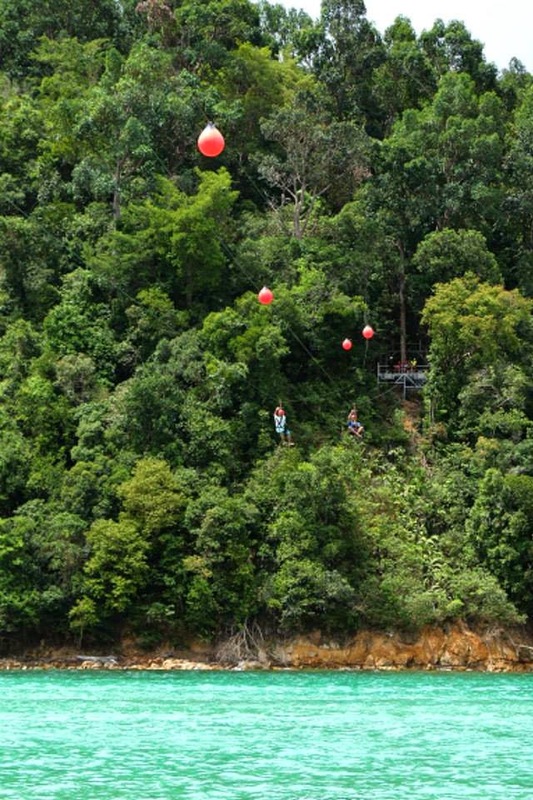 That few seconds of feeling absolutely weightless as you launch unto the zipline! Seconds later, i'm over the fear of falling over a cliff to my doom. "I LOVE SABAH! So so beautiful! No where else i'd rather live!" 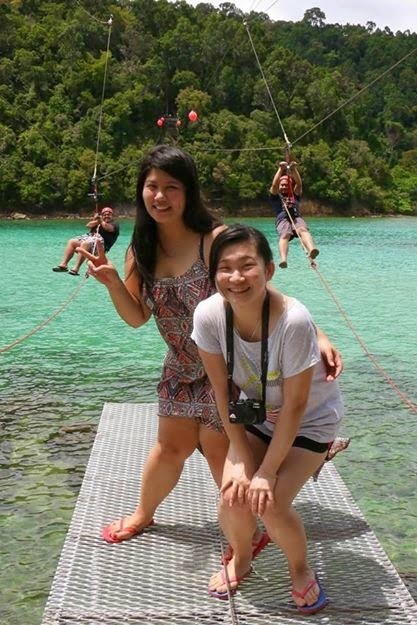 Best part of the zipline is when I have crossed the sea between two islands and approaching the end. Dude, have you studied physics? I must have been travelling at about 60kmph?! Terrified at that thought, i started screaming towards the end of the zipline! Adele and I at the end platform as the boys zip in with huge SMILES on their faces! A few pictures at the end platform, i took a short walk back through the jungle and found myself back on the relaxing beach of Pulau Sapi. Now where is my man for an afternoon swim and smooch? More pictures with lots of details, check out my facebook photo album! Want a relaxing day out in the sun? Do it like how the celebrities do! Hop on a private speed boat to super luxurious 5-Star Bunga Raya Resort! Chibi-sized by Kendy! - Sabah's Comic Artist!